This could be forming a 123 low??? so the level to watch is 0.9344 so about a 100 points away from now. Obviously the price could still go down furthur. Ive put this chart up so as you could see what i look for. So keep an eye out on this. Last Edit: 28 Jun 2013 11:40 by remo. i forgot to mention this last night. Ive got a 40 point stop on this. the one below should be the right one. Im more of a day trader so rarely look at the long term picture. Im all about quick profits from a day trading perspective I focus mainly on the daily charts. From a long term perspective ,This currency pair is in a sideways market so basically a sideways trend. If you look carefully you can see a descending triangle on this and the level to watch is 9403.So below this and this would tumble. Last Edit: 04 Jun 2013 09:52 by remo. Hi Remo, I agree with you on this trade and I also took it and got out with soem proffit. I was pondering re-entering, but I just looked at the 200ma on the weekly. I hate to be the contrarian here, but it has closed below the 200ma on the weekly and looks like recent rally was just test of the 200ma. This makes me think there will be further down side. What are youre thoughts on closing below the 200ma on the weekly? this has moved 60+ points since i tipped it. I normally use a 40 point stop on currency trading when entering on a break out. Last Edit: 22 Apr 2013 11:54 by remo. Remo's downtrend seems the obvious place ie 1.0541 ish. Not only is it the main downtrend but, if we consider the pennant to have been a wave 4 triangle with wave 1 up from 1.0111 to 1.0301, we also have a wave 5 target of (1.0301-1.0111) 0.019 + (wave 4 low) 1.0341 = 1.0531 which is where the main downtrend will be in a few days' time so EWT suggests this as a target too. first target is almost there at 10432 which was the breakout trend line(short term) dont ask me why but for some odd reason even thou the trend lines is higher than the initial break point it still causes a resistance. Last Edit: 21 Mar 2013 12:22 by remo. Looks good! Have you a target in mind? The downtrend as Remo suggested or the pennant break target? Bounced nicely off the 4H uptrend support, then broke out of the pennant remo highlighted and backtested it perfectly. Nice call remo! sorry forgot to put chart up yesterday. Theres a nice flag formation on this so possible continuation pattern. If it breaks out past 10410 then this could move higher towards the main down trend line(10541). My order at 1.036 got hit so am now long on this. Will add on a break above 1.041 per remo's post. possible short term 123 low??? This is currently testing the breakout point. stops below 2. Last Edit: 13 Mar 2013 12:02 by remo. Another thing to note that adds risk to the trade is the EurUsd chart. There is a case that this chart is showing bullish signs, and I don't often like to take trades where two charts like these are not correlating as much as I thought they would. Initially targeting 10190 but I believe that could be a conservative target. We shall see. 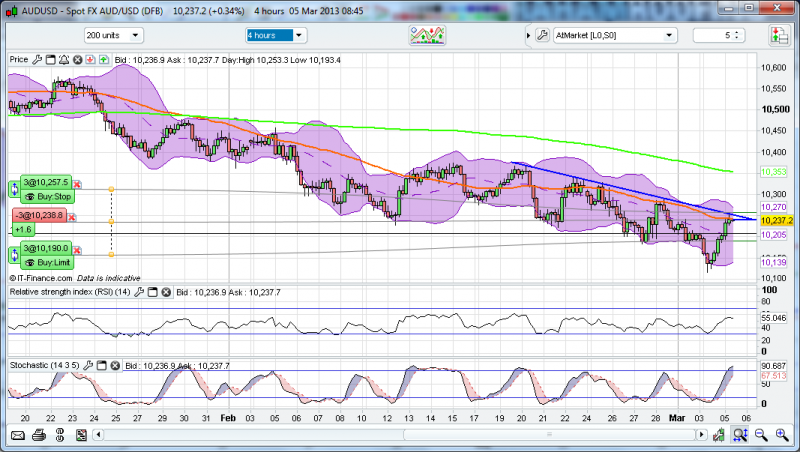 Smaller timeframes such as the 15m showing bearish divergence at those highs. This is a short term trade, I know there is a support level just below and there is an argument that this will head upwards - but I believe in the short term it will respect the resistance level and it is also why I picked a conservative target. This followed through last night but I still think there's a chance of 1.0165 area for a long entry with stops below 1.011 as that's the 61 fib of the initial rise (so far). If it races on then I'll just wait for a retrace. I'm not chasing it. Maybe one to try remo's method of entry half way down the hammer with stop below it if it closes like this. Right at the bottom of the symmetrical triangle. Updata has the high of the 10th at 1.0601 and flags it as an inside bar. I'd say the major resistance at 1.0623 needs to be considered. IG charts change at different times so thats most likely why. on Metastock it changes at 10pm every day but on IG i think it changes at 12am so that will cause a whole load of problems. we have tested this system out on metastock so dont know what the results would be based on IG but Would be interesting thou to know the difference. Thanks for letting me know . Im gonna go long on this at the back test of breakout point at 10555 with a 40 point stop. trend line levels change every day. Last Edit: 11 Jan 2013 00:18 by remo. first thing you need to do is to redraw the trend lines. Then id be careful with doing anything when the price is near the apex of the triangle as this area is where most real breakouts happen. I would normally short on first attempt of that down trend line but this time due to the apex i wont be doing that. Im looking to catch the breakout of the triangle this time due to there being an inside bar just above that trend line as well. My long entry is at 10586 with a 50 point stop due to it being currency. Easy question to answer as far as I'm concerned...leave alone ans wait to see what happens at the downtrend resistance. If it get's that far I personally wouldn't automatically go short as it's not long since it last tested it (I don't like trendline touches too close together). A close above that trendline and I'd be going long - a clear rejection of it and I'd consider a short but I definitely wouldn't do anything until then. How do we analyse this now. Do we await rejection from the triangle or leave alone? Im planning on going long at 10431 with a 40 point stop on a first touch basis trade. This is at the bottom of the symmetrical triangle. Theres always risk involved when your entering near the apex of a triangle so bear that in mind. The long entry is wrong for the inside bar entry. it should read 10573 as the high was 10568.
i could have sworn this level has changed since last night. Im going mad i think. This has got an inside bar right at the breakout point so this gives the added signal to go long on the inside bar breakout at 10566 .Thats about 5 pips above the inside bar.Im using 50 point stops on this. This will be a symmetrical triangle breakout and the trendline as well.This level has some resistance here but if it does punch through then this could really fly. Target could be as high as 500 points.So basically the highs again.So good risk to reward on this. 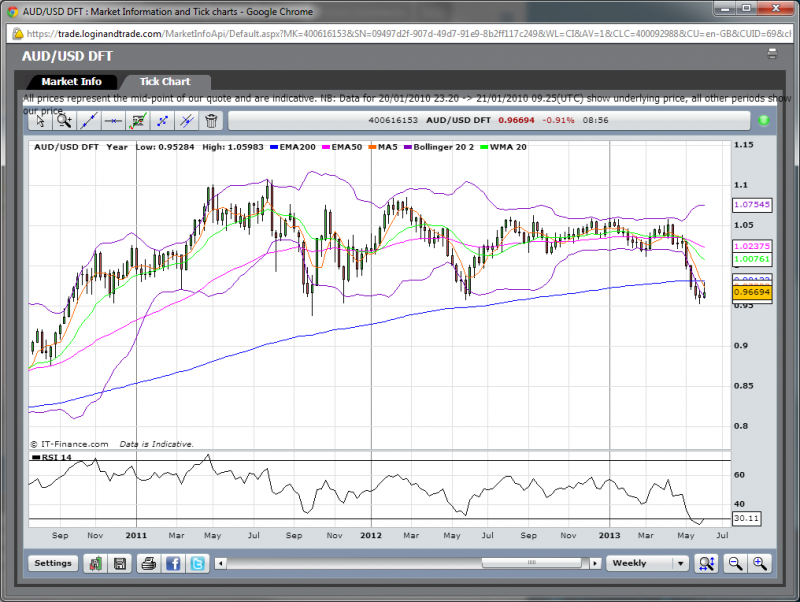 This is getting close to the apex so hopefully should breakout before geting there. Last Edit: 17 Dec 2012 22:15 by remo. Normally i would short the trend line on first attempt but due to the assending triangle breakout i did not. catching break outs is a dangerous game as most are false breakouts. So if this does finish above that trend line then i would look to enter on a pull back to test the trend line. The apex is always a good indication of a breakout looming , and this is in the apex zone hense why going short can be a tad risky. This is just my own way of doing things and everyone has a different way. Last Edit: 12 Dec 2012 19:40 by remo. Typically speaking would you wait for a back test of a trend line when taking a trade like this ? 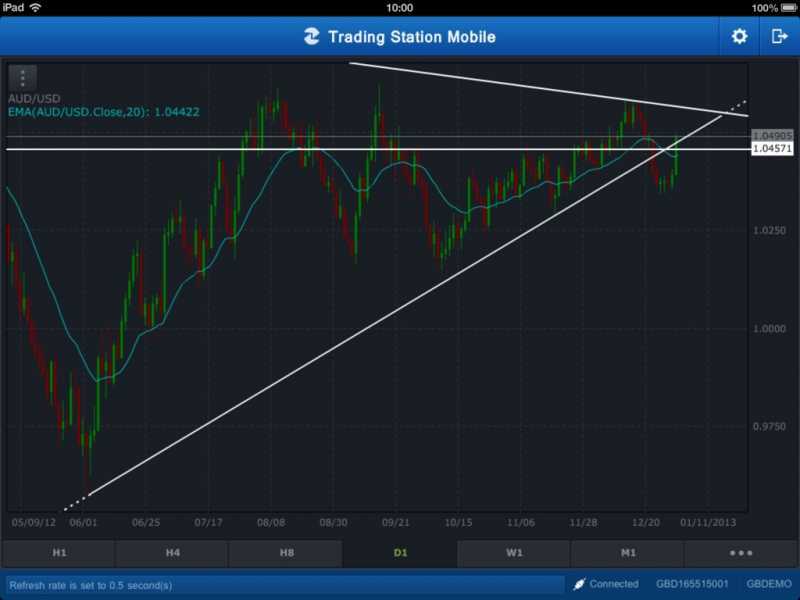 This is breaking out of the main trend line now and the symmetrical triangle as well. If this finishes above the trend line then that opens up the highs again. This has been a very profitable trade so far . This looks like its going to breakout. The target should be the main down trendline first.